The five-year residence of Maria Callas in Greece. "The historic but long-neglected building at 61 Patission Street in central Athens where opera legend Maria Callas lived from 1940 to 1945 before she left for the United States is set to undergo renovation work so that it can house the Maria Callas Opera Academy, as daily Kathimerini online reported. 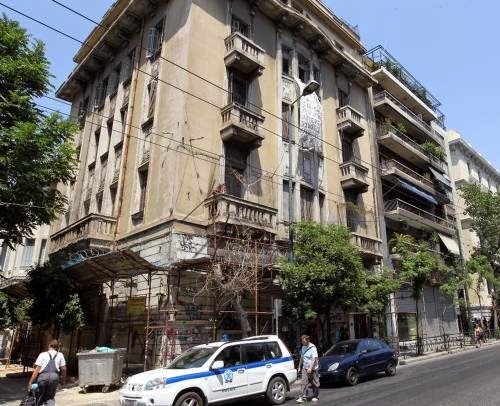 The City of Athens has already reached an agreement with the owner of the building, the Sailors' Pension Fund (NAT), and officials are reportedly working out the details so that the project can be included under EU Community Support Framework for Greece in 2015. The agreement was marked yesterday with a grand opera gala concert organized by the association for the building of the opera house and the academy in cooperation with the Greek National Opera. Artistic director of the Greek National Opera Myron Michailidis said the organization would support plans to establish an opera academy. Born Maria Kalogeropoulos, Callas first performed in Greece when she was 18. She died in Paris at the age of 53 in 1977." [Source] "A rich audio-visual exhibition with emblematic photos and interviews, along with personal objects, will be presented in two of the building’s three floors. The museum will also have a library with books and records for opera lovers. Additionally, there will be a hall for temporary exhibitions, classes and small opera concerts. The ground floor will feature a thematic museum shop as well as a bistro named La Divina, where visitors will have the chance to taste some of Callas’s favorite dishes." [Source] After the jump is a complete list of operas that the hallowed walls of this apartment would have heard Madame Callas singing during this time period.